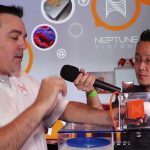 We saw Ultrareef’s vessel tank during PetsFestival 2015, and we appreciated it right away. 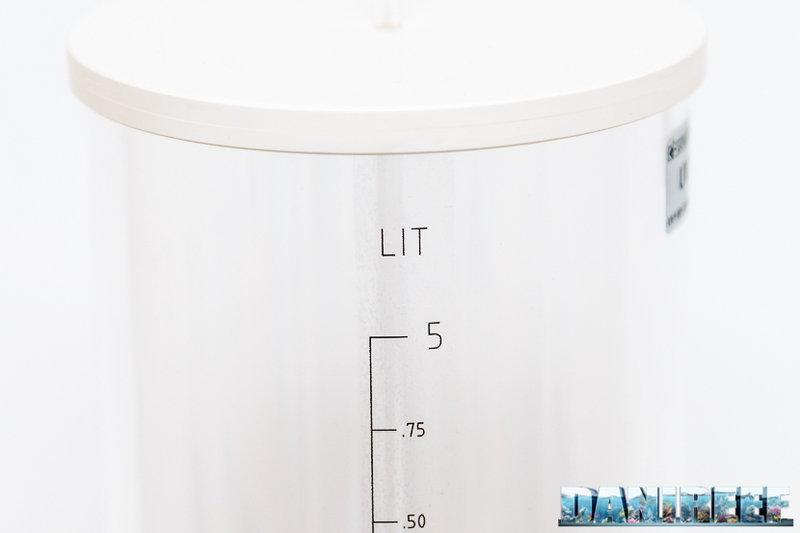 The vessel tank only comes in one model, it is 5 liters and built entirely of acrylic and white PVC, with a closing cap, conical bottom, and draft rod from the bottom. 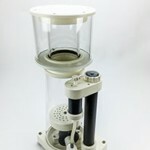 This vessel tank, like similar products, can have several uses, including the management of the integration of the Balling Method, and the breeding of phytoplankton and zooplankton. I, however, wanted to dose kalkwasser in aquarium, and this vessel tank arrived at just the right time. 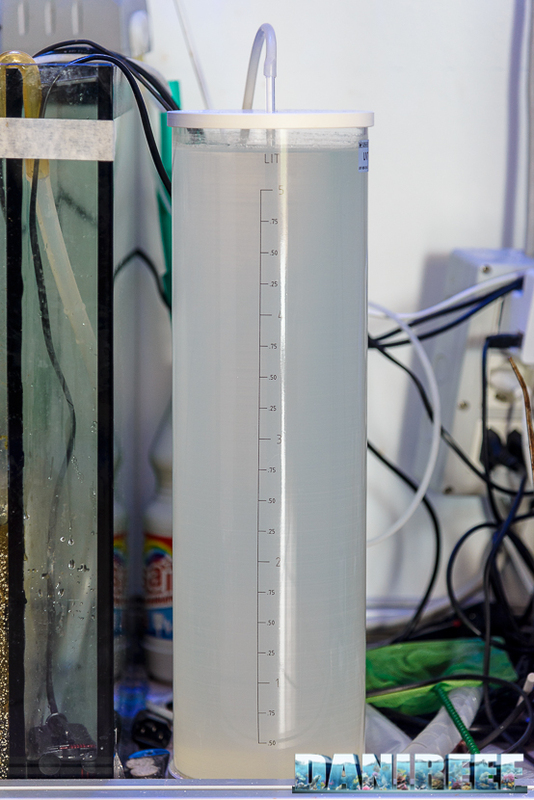 Dosing kalkwasser is a good way to provide a bit of bioavailabile calcium in the aquarium; it can also increase pH considerably, and, according to my knowledge, it’s the only guaranteed method to do it. 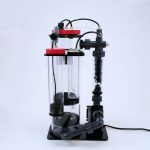 If we also use calcium reactor, we can get a perfect combination for the management of a SPS marine aquarium. 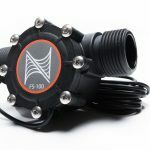 Pumps are not included, and a component like this works best with a dosing pump pulling out water from the cylinder base through the draft rod. 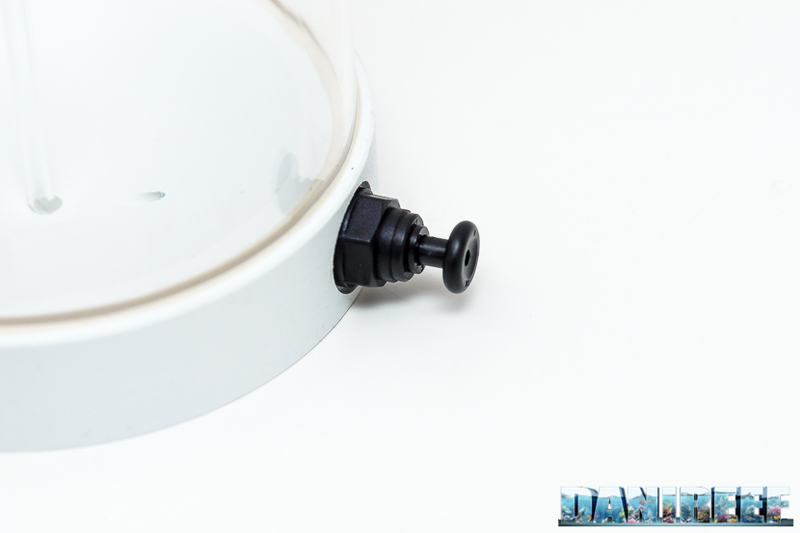 Pictured above is the John Guest quick release that allows the integration of water or air from the cylinder base, depending on how you want to use the vessel tank. I never used it myself, as I had a different purpose in mind. 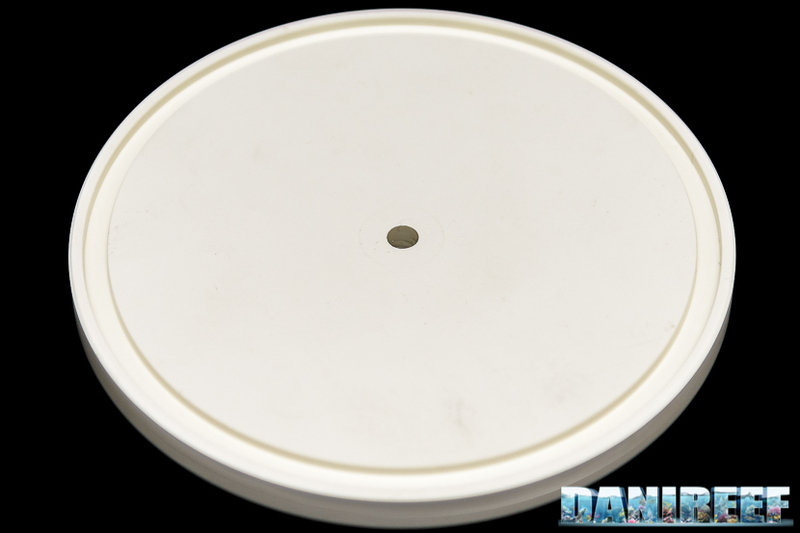 Here is a shot of the closing cap, made of white PVC, which closes the cylinder from the top and has a central hole for the draft rod. Pictured here is the sticker on the side of the vessel, which shows in a practical and very visible way the remaining capacity of the vessel tank. For our test, we poured a teaspoon of calcium hydroxide into the vessel, and then added osmosis water up to fill the cylindrical tank. 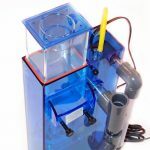 In the past, I’ve always added the two parts to a very small tank and then shake it to make the solution, but this time, I could leave the action to the water, falling from the tank to the cylinder. I can usually empty a 5-liter vessel tank in two days or so; at least in the past few winter months, the evaporation has slowed due to the temperature. We used a dosing pump from aqua1 to dose the tank at a rate of 100ml per hour, for a total of 2.4 liters of solution a day. This number may seem huge, but I verified that manages to keep the aquarium at a pH of 8.50. 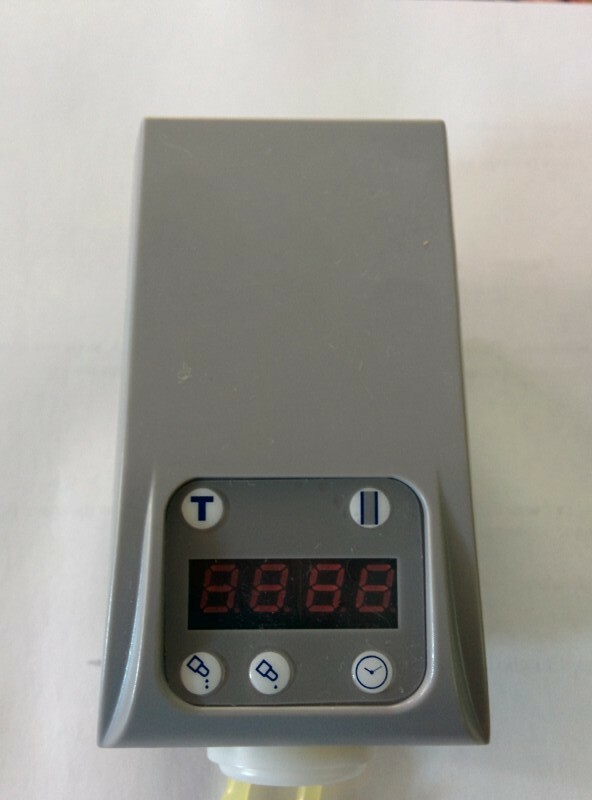 If you exceed this limit, the controller cuts power to the dosing pump. 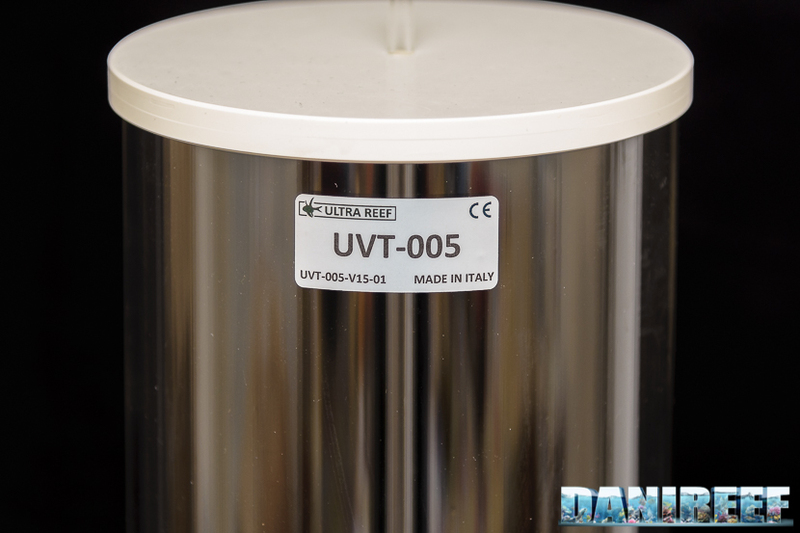 These vessel tanks are perfect for using the Balling method, utilizing three vessels coupled with three dosing pumps. They are beautiful to look at, with a high-quality construction; they are practical and take up little space.